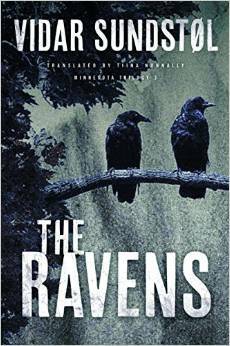 THE RAVENS by Vidar Sundstol (translated by Tiina Nunnally) is the closing instalment in the Minnesota trilogy featuring unlikely hero Lance Hansen, plodding US Forestry service cop. This sequence of books is set amongst the small lakeside towns of the Norwegian-American diaspora. First book in the series is THE LAND OF DREAMS, in which Lance had a tangential role in a murder investigation, after he found the body of Georg Loftus, a Swedish tourist who had been brutally killed at Baraga's Cross. The second book in the trilogy, ONLY THE DEAD was very different in feel. Instead of focussing on Lance's interactions amongst the small-town Norwegian-American and Ojibwe communities, the main action of ONLY THE DEAD revolved around a grim wintry hunting expedition by Lance and his brother. This book was tense and claustrophobic, as it was unclear who was the prey. THE RAVENS proves to be different yet again from the preceding books. At the start of THE RAVENS, Lance has run away from his troubles and is hiding out at a small town just over the Canadian border. He has lied to his family and colleagues by telling them that he has decided to take a holiday to Norway to visit his ancestral roots. Eventually Lance gives up this ridiculous charade and returns to his home-town, forcing himself to confront his fears about his brother Andy. Lance is afraid of his brother. He is convinced that Andy was involved in the murder at Baraga's Cross, and is tormented by the dilemma of whether or not to speaks up about his suspicions. He is particularly troubled as if he stays silent an innocent man, Lenny Diver, who is currently on remand for the crime, may end up serving a long prison sentence. Lance forces himself out of his comfort zone and ineptly delves into the past in his attempts to uncover what exactly happened at Baraga's Cross. He tracks down Clayton Miller, victim of an assault by Andy as a teenager, to find out more about what makes Andy tick. He tries to rebuild connections with family and friends in his quest for information, as he fights the anguish in his head and the lure of the snowy lake, driving himself to the brink of his sanity. His improving relationships with his niece, teenage Goth rebel Chrissy and with his ex, Debbie Ahonen, help provide some stability for Lance at this difficult time. THE RAVENS is an intriguing finale to an unusual trilogy. As with previous books in the series, the focus is more on the landscape and people of the borderland communities, and the turmoil in Lance's mind, than on action and thrills. THE RAVENS did feel a little slow at times, and Lance's failure to simply ask direct questions of his brother can be a little frustrating. But Lance's reticence is just about credible as being in keeping with Lance's emotionally inarticulate nature. The themes of dreaming and of Lance being haunted by the spirit of Swamper Caribou are interestingly developed in this book and play a part in Lance's eventually uncovering of the truth about the murder. The ultimate resolution of the crime ties up the loose ends more or less satisfactorily, managing a reasonably thrilling twist in the tale. THE RAVENS would be readable as a standalone, but the reader would get more out of having read at least THE LAND OF DREAMS beforehand. I found this trilogy to be among the most boring books I've ever read.They were highly reviewed by everyone.I kept waiting for them to "kick in" but,somehow,they just didn't !! !